This is the next pattern for Vol. 2 of the patterns ebook. This one is called chōchin izutsu-tsugi. Just to confuse the issue, I’ve also seen it called izutsu-tsunagi and chōchin izutsu-tsunagi (my reference is a series of books written in the early and mid 1950s, so I’ll stick with those names). Chōchin (提灯) are Japanese paper lanterns and in the pattern you can see three chōchin along the center row. 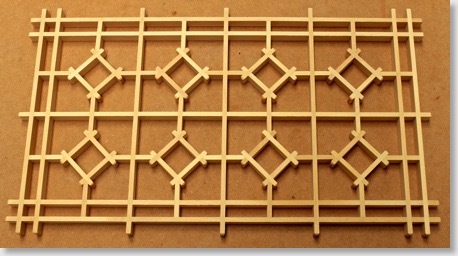 The izutsu (well curb) pattern is used to form the lanterns, hence the chōchin izutsu-tsugi name. 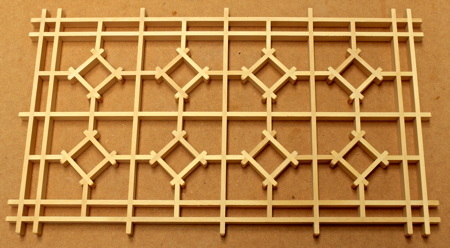 While it may look fairly simple and straightforward, all of the locking pieces for the izutsu squares intersect the main jigumi kumiko with half-lap joints, so if the measuring and the cuts for both the kumiko and the izutsu squares are not exact, they ain’t gonna fit. There’s certainly enough of a challenge in the pattern to keep up the interest level. This is the second-to-last pattern in Vol. 2. The last will be the izutsu-kiriko-tsunagi, which is also a member of the izutsu pattern family. I’ll cut and assemble that pattern over the next couple of days, then finish off the writing side of the book. After that it’s on to Vol. 3 and some fairly complex and difficult patterns. These will still be based on the square jigumi. The diamond and triangular patterns will come later.